My kids love meatballs. We all love anything to do with tacos. 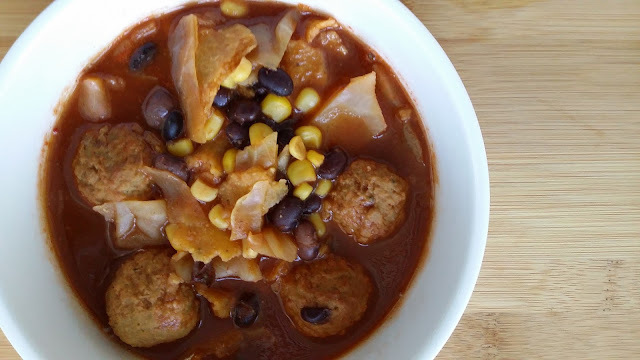 Since we were still trying to blow through the pantry and freezer items in our kitchen, so that we can clean out and get ready to re-stock, this soup was perfect. I used mainly freezer and pantry items again. It was pretty easy and everyone liked it. We had some taco night ingredients that were left over that we used for this. Guess what? It has a "secret" healthy ingredient~~ cabbage. I swear that head of cabbage is gonna last me forever! I didn't add any salt, because I figured the broth, taco shells, taco seasoning, canned stuff, etc. added enough sodium. I thought it would be a Super Salty Soup (say that 10 times fast!!! ), but it was just right for us. Actually, I could see how some other people might want to add a little salt. It didn't end up tasting as salty as I thought it would. Pour chicken broth, water, tomato paste, taco seasoning mix and seasonings into stock pot. Cook over medium high heat while stirring ingredients together. Add the meatballs, corn, cabbage and black beans. Bring to a low boil and then reduce to low. Simmer for 30 minutes on low. Add broken taco shells and cook for 3 minutes more. Ladle into bowls and garnish with sour cream, avocado or cheese. Do you like thrown together soups? What's your favorite way to use up kitchen freezer and pantry staples in your home? Take a minute and follow on Facebook ??? Pretty, pretty please? With a cherry on top? Make sure you never miss a Mish-Mash post. Follow by RSS or Email HERE.